Welcome to the newest article of @ryantank100. In this article, he discusses his football manager 2015 defensive tactic from his latest Persiba Balikpapan career. Here he shows you how you can build a great defensive tactic in Football Manager 2015. With a great defensive 4-3-3 formation build on the knowledge of player role and duties he aims to show you why defending is the best attack. 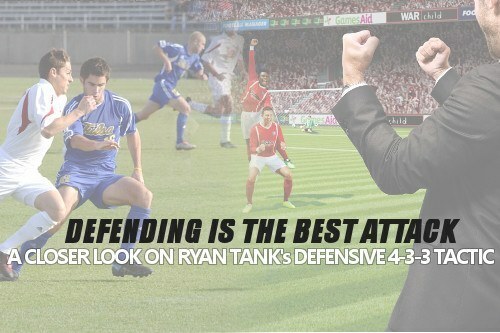 Even though this article gives you an unique insight to Ryan Tanks Football Manager 2015 defensive 4-3-3 tactic used in his personal FM15 career at Persiba Balikpapan of Indonesia Super League (ISL) 2014/2015, we will not provide a download link to the tactic as we like to show you the main principles of utilizing defending as great way to conquer your opponents based on counter attacking and from a solid defensive block. Instead we hope this article gives you motivation to try to build a tactic based on unity, compactness, solid structures and defensive cover instead of controlling and overloading your opponents. When you play defensively against a very attacking team, that is the time when you have a lot of chances to make potent counter attacks. When you break your opponent attack, the attacking transition, is started at the same time. The players with attacking roles-duties would be the most aggressive ones in finding ideal attacking positions. Here is the moment when the attacking role in defensive tactic find its true friend. I use 4-3-3 (4-1-2-2-1 wide) Why? Based on squad depth screen + my players attribute, the formation of 2 central defenders, 2 full backs, and 2 attacking wingers (ML-MR or AML-AMR) is the most ideal formation to use. In the centrak midfield, I have 2 major choices, playing with 2 CMs and 1 AMC or playing with 2 CMs and 1 DMC. I choose defensive as match mentality. In some matches, I adjust the mentality based on the in-game situation. There is the time when I need to play slower and extreme cautious, so I choose contain as the mentality. When I need to little bit up, a little bit higher tempo and cautious style of play, I use counter. For my team shape, I choose very fluid (at the early stage of my save), which I tweaked it to flexible. Shorter Passing : On the manual we get this “greater ball retention”. Just that simple. This instruction triggers the players to be more cautious at passing. By shorter passing, you are instructing your players to prioritize the short passing play. If you feel, to some extent, shorter passing is not enough, you can add retain possession and play out of defense. Low Crosses : I’m using lone striker shape. My striker has 5 for strength, 3 for jumping, and 13 for heading. It shows us a fact, that my striker is not a beast at aerial duel. Too bad to be the one to rely on for his aerial ability. So, I decide to avoid making float cross. I ask the players to play with low crosses. Push Higher Up : I instruct push higher up in order to avoid my team to be more pressurized deep into our own defensive line. When the team on attack, my players will try to occupy the highest area they are able to reach (and not holding themselves too deep in our own area). Stick to Position : I choose some aggressive roles, so I have to make sure there is a filter to control such aggressiveness. I hope my players to keep our basic shape. Close Down More : Simple, guys. I need to make sure my players still press the opponents. Use Tighter Marking : In Indonesia Super League (ISL), most of teams are using 4-4-2 or 4-5-1 as their formation. This two formations have different strength and weakness to deal with. As what you can see in the use tighter marking manual, there is “stick particularly to their assigned opponent”. When playing against 4-4-2, we might be winning the central midfield area or the space between my central midfielders and central defenders by creating 3 v 2 situation of clash (my two CMs against their 2 CMs, but, I have “spare”, with my DMC). When against 4-5-1, “use tight marking” will create the direct clash between the “same area positions” (my 3 midfielders vs opponent 3 central midfielders). Based on this situation, I hope my defenders are able to concentrate to isolate the opponent lone striker. Be More Disciplined : Persiba Balikpapan is categorized as a Low League Management (LLM) team. I have to make sure my players to not making too much improvisations (creative freedom). For me, by not instructing be more expressive is not enough. I have to still remind my players to be more disciplined. In its implementation, Team Instruction is adjusted based on the in-game situation and opponent strength. To make the right adjustment, you need to understand the attacking tactic to make your defensive plan and hit your opponent at the right time with the right execution. Retain possession, middle/flanks exploit, wider or narrower play, get stuck in or stand off opponent, being the instructions of which I often tweak, based on match by match situation. The two Full Backs : I need my two full backs to give enough support for my two attacking wingers. They don’t need to make long shot or amazing long pass. DMC : One main choice for this position, is, defensive midfielder (support). For some specific occasions, I plot my DMC as a deep-lying playmaker (support) or Regista. I just need to make sure they don’t dive themselves into risky business. Central midfielder partner : box to box midfielder, central midfielder (attack), and ball winning midfielder (support) are the three roles to choose. Niko Malau, Helmi Loussaief, are the two first choice players. hen I play Rendy Siregar, I plot him as a ball winning midfielder (support). For my Box to box midfielder I need him to avoid making much dribble with ball. For his partner, I used to play a central midfielder (attack) with close down more as the default Player Instruction. Attacking Wingers (AMR-AML slot) : I have for choices here, Ahmad Sembiring and Fandy Mochtar (right side). Novriansyah and Ansu Toure (left side). Ansu and Fandy are more suitable and become more lethal when I give Inside Forward as the role for them. Ahmad and Novriansyah, are more to conventional wingers. Like what I always see when my wide men are on possession, the main thing I try to focus on is where the most time their crossings find the target. If my opponent give much time and space on their far post, I’ll try to instruct my boys to target their crosses to that area and vice versa. Central Forward : I choose to pick up the roles which let my striker to drop deep enough to link with the second line. I usually choose Deep Lying Forward and Complete Forward as the role for my striker. On Opposition Instruction, I set closing down always to the opponent GK and central defenders. The Defensive 4-3-3 Attacking transition. The AI attack broken by our DMC, he then forwarded the ball to the AML, to be later distributed to the CF. Each players position themselves at the right area with ideal distance between the line and players. Here is one of the best example how the two central midfielders act their roles as false eight. Good teamwork and understanding, between the two CMs and lone striker be the main reason we score on this occasions. Goal from box to box midfielder. The false eight concept and the positioning of my lone striker had helped to open the space for my Loussaief to release a pass and let Malau (BBM) to get into the box and scored. Here is the example of a goal from counter attack. Our DMC, Rendy Siregar, broke Persik attack. He then passed the ball to Lestaluhu who dropped deep to the team 1/3 defensive area. As Lestaluhu ran with the ball forward, our right back, two attacking wingers, and two central midfielders (who given attacking roles), quickly ran forward to fill attacking positions. And, here is the image of Sembiring goal. Attacking role-duty in defensive tactic helps you to create many potent counter attacks. The ISL is still on progress and enters the last stage of the campaign. Persiba Balikpapan have finished their 29 matches (9 to go) and topping the table, 7 point ahead of Persela Lamongan at the second place. This tactic has so far functioned well, very well indeed (or too well?). Because, personally, I targeted my team to finish in top ten. If, in the end, we successfully get into the top three, it would be an amazing achievement, as we only predicted as one of the relegation candidate. No tactic download. The reason had indirectly said in the article, as I make a lot of tweaks, based on in-game situations. By reading this article, I hope you get my considerations in establishing a great defensive tactic in Football Manager 2015. And by reading and understanding it, I hope you can develop it far far better, based on your tactical need. Created a tactic based on defensive solidity? Share your Football Manager 2015 tactic with us!